So I have news! For a while now I've been toying with the idea of video blogging about healing and intuition. Not everyone likes to read and sometimes a short video is just quicker. But I'm a behind the scenes kind of gal (and this blog was anonymous for the longest time) so I'd been putting it off. No more! I recorded my first video yesterday: Connecting with Your Guardian Angel. It wasn't as awkward as I expected it to be, although I still feel weird looking at myself on the screen. I didn't have to think about my hair when I was just blogging, lol. Watch it here, and follow this link to OM Times Magazine for 7 Ways to Make Your Guardian Angel's Job Easier. The video only covers my first point in the article, good stuff! 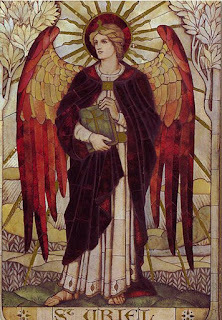 I'm still in London for two more months studying angel channeling. Hopefully I'll have lots to talk about. My goal is to record a short video almost everyday until I get the hang of vlogging. For example, in the Color Healing Meditation I slipped up and referred to the Solar Plexus Chakra as the Sacral (my bad!). It's part of improvising but I hope it won't happen often. Anyhow, I'm looking forward to this! Follow me on Youtube and wish me luck! If you have questions about Healing please shout, I'll try to address them.